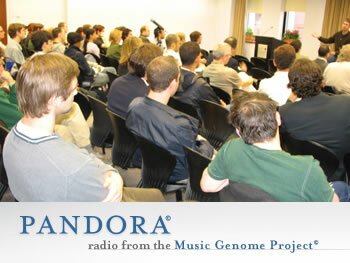 Last week I attended a "Get Together" event for Pandora users. Pandora is an internet radio station that allows users to create their own channel based on a particular song or artist, then Pandora plays similar music. As each song plays you can give it a "thumbs up" or "thumbs down" which helps Pandora learn what kind of music to play. It's really a lot of fun to use and it's great for background music and for finding new artists. Also, Pandora is free. Tim Westergren, the founder of Pandora, ran the event and he essentially told stories about how Pandora started and took questions from the audience...for over 2 hours. The experience was absolutely amazing. We were able to get direct responses to questions, new feature requests, problems, and even details about the pending legislation in congress that could hike the licensing cost of music for internet radio stations and shut services like Pandora down. But more than anything, the event made all us listeners feel really important. Quite frankly, I can't think of too many more effective ways to build a brand and create customer evangelists than events like this. More companies should find ways to reach out to their customers/users directly and personally.